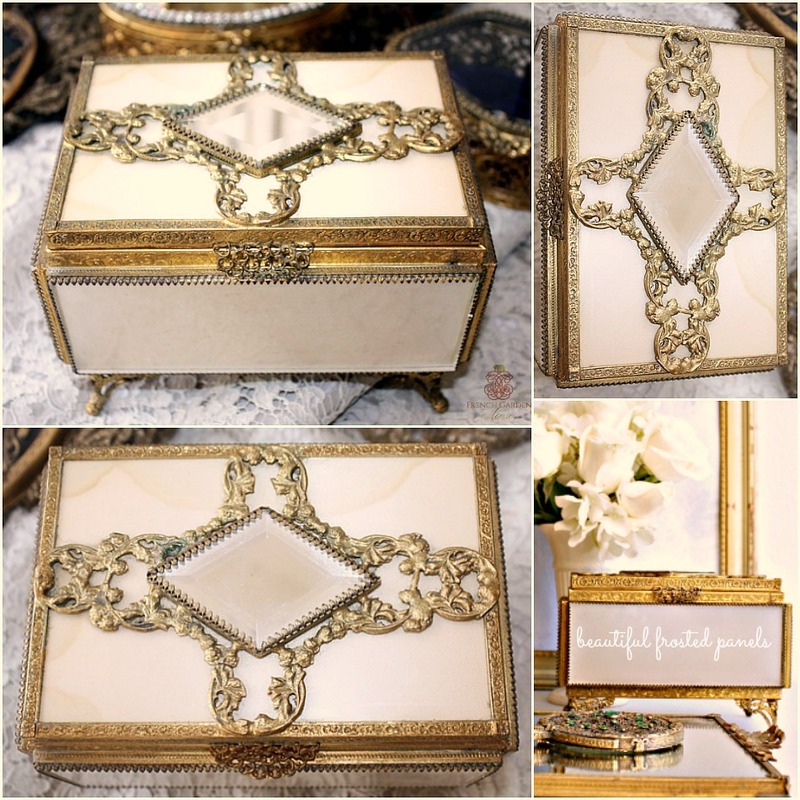 Gorgeous and very decorative Large Satin Glass Jewelry Casket or Box, with frosted or satin Glass side panels, glass covered Silk top set with decorative floral detailing and large bevelled mirror diamond on the very top. Lovely gilt 24kt. gold plating, diamond pointe edging, and sweet cabriole legs make this a stand out piece for your vanity collection. Beautiful floral embossing on the gilt pieces, legs have an art nouveau styling, just perfect. Rare to find this one with the unusual combination of glass, the gilt is meant to emulate ormolu. The inside mat is tufted velvet, with little gilt "buttons", this was most likely made by one of the better manufacturer's such as Matson or Stylebuilt as they were careful to add details such as the tufted bottom liners. Not for the perfectionist, there is slight water staining to the silk top as shown, and one of the glass panels does have an edge chip, nothing too detracting. 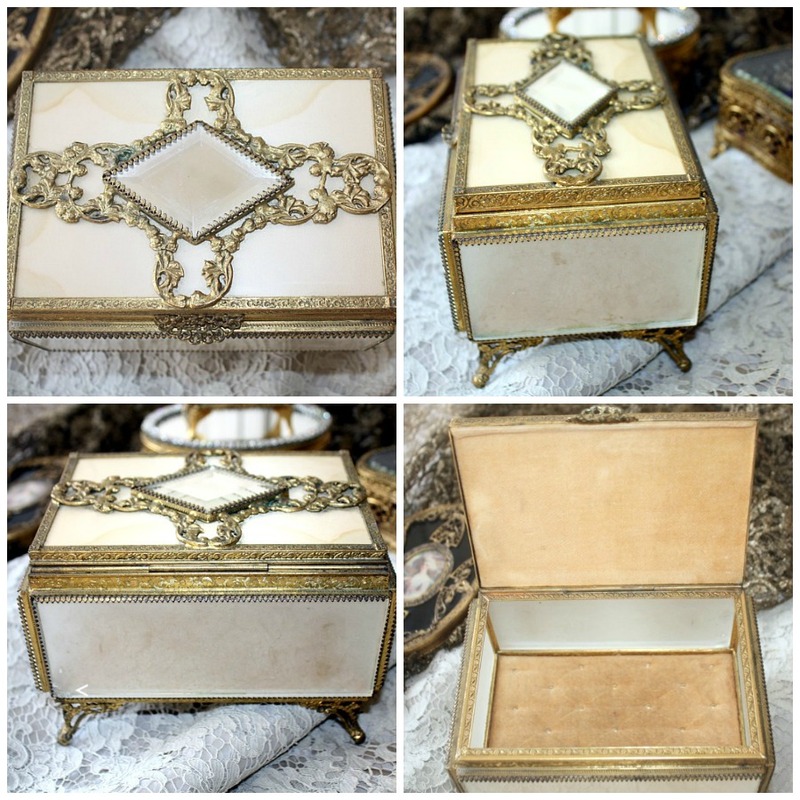 An exceptional addition to your collection of antique and vintage jewelry caskets, and a fabulous size, measures 7" x 5" x 5".